Looking back at those exchanges, I know I wasn’t interested in the paints alone. I wanted the whole package. I wanted to learn how to do something and have all the tools to make it happen. When my requests for the craft kits were met with a winter of “no,” I scoped out a new object of desire: Klutz books. Specifically, Simple Sewing. A cover-mounted plastic pouch contained pieces of felt, tiny spools of thread, needles, and ribbons in a miniature rainbow. It was perfect! I just about collapsed under the economic reality. Both my brother and I received a $5 weekly allowance during the school year (if we got straight As on our report cards). During the summer, we got nothing and had to grovel for extra chores that would earn us some cash. The only chores my parents would trust me with at the time were to wash the car, fold laundry, and separate zinnia seeds from the petals for my dad’s garden. The problem was that none of these tasks needed to be done more than once a week, and I wouldn’t get paid more than $5 for each chore. It ended up taking me two weeks to save the money, an eternity to an 8 year old. The moment I tore the last zinnia seed from the petal, that earned me my last $2, I shouted, “That’s $22! Now take me to the bookstore!” He made me wait until the next afternoon as punishment for being bossy. The humanity. The entire car ride to the store, my dad and my brother teased me. “Maybe the book will be gone! Someone else may have bought it.” I sat with my fingers in my ears for the rest of the trip. At the bookstore, I speed walked to the kid’s section with the fury of an 80 year old grandmother at the mall. I was ready to claim my prize. It was right there on the shelf waiting for me, and I proudly carried it to the cashier. My sewing adventure was about to begin. I made every silly project in that book. I’m not sure why an 8 year old needs a scented sachet, but I made one. I didn’t even know how to pronounce sachet. My mom was in hysterics when I showed her my “sach-it.” The strawberry pincushion was my favorite, and I must have made half a dozen. My stitches on my dishtowel apron, were so wide that my mom restitched my seams while I made my seventh strawberry. When I see IG friends post about teaching their young children to sew, it touches my heart. I had so much satisfaction from my horribly constructed felt monstrosities. When see pictures of a 6 year old sewing on a sewing machine, I can only imagine the sense of pride and accomplishment that child must have. If I have a kid one day, I hope I can share the joy of making and crafting with them. I know right?! This was the only one I ever got, but I drooled over them constantly! I love this entry! 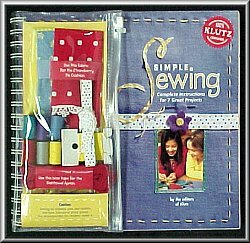 And I loved those Klutz books too, although I don't remember the sewing one. My daughter is 2 and I can't wait until she's old enough to mess around with sewing! Thanks! I'm hoping if I have kids today I'll have the patience to teach them, haha!